We disciples of Jesus Christ can be confident that God loves us, that God never gives up on us, and that God can bring hope to hopeless situations. Our confidence springs from the fact that there is much more to reality than meets the eye. 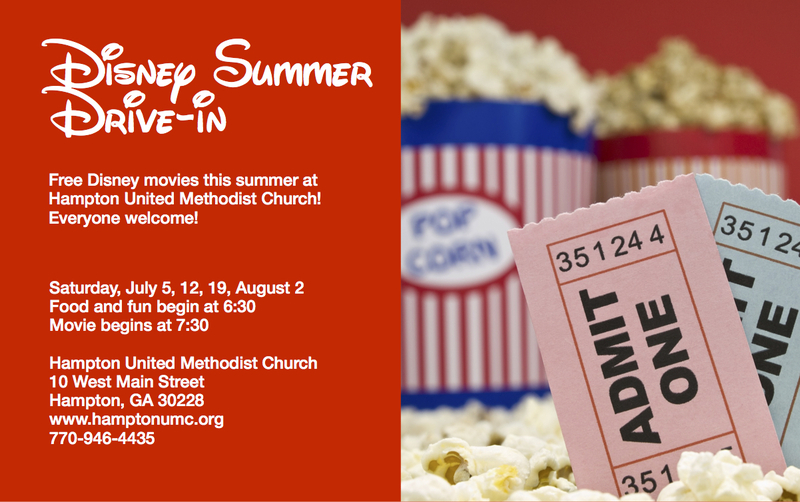 This sermon illustrates these themes using clips from the movie Toy Story. Recently, my boys and I have enjoyed throwing the Frisbee around. We haven’t had a real Frisbee… just a cheap knock-off with an insurance agent’s name on it. Well, I say cheap knock-off… The truth is, we’ve been playing with this Frisbee for a while, and we all thought that it was perfectly fine. Until… Until I saw on Amazon last week, the Cadillac of Frisbees: the Discraft Ultra-Star Ultimate 175-Gram SportDisc, made in the U.S.A. Eight dollars on Amazon. I ordered it because I will be joining my family at the beach after church today, and we’re going to throw the Frisbee there. So I was excited to tell my son Townshend about the Discraft Ultra-Star Ultimate 175-Gram SportDisc. And I showed him the picture on Amazon, and he was like, “That’s awesome, Dad. What color did you get?” I said, “Black.” He said, “That’s cool… Oh, hey, look at this bright, multi-colored one. That one is beast!” And he was right: the bright multi-colored one was beast. And it was the one I was going to order originally, but it was $4 more, and I couldn’t justify it. But now that Townshend pointed out how awesome it looked, I immediately felt buyer’s remorse. Ugh! I went online to change my order but it was too late! My point is, based on my own experience, these toys in Andy’s room have good reason to be nervous and threatened by the prospect of shiny new toys like Buzz Lightyear. And we see that even Woody the Cowboy, who was previously Andy’s favorite toy, has been cast aside to make room for the new toy. It reminds me of a story in Genesis about Hagar and her son Ishmael. You might recall that God inaugurated his rescue plan for the world by calling Abraham to start a family and create a nation, Israel. The only problem was, Abraham was 75 years old. His wife Sarah was 65. Both of them were past the point of having children—and, oh by the way, they were unable to have kids when they were of childbearing age. But Abraham and Sarah trusted God that he would fulfill his promise and give them a son. At least they trusted for about 11 years, at which point they began to doubt that they would ever get pregnant. So they took matters into their own hands. Sarah’s idea was that Abraham could take her young, beautiful Egyptian slave-girl, Hagar, as a second wife, a concubine, and sleep with her, and have a child by her. And Abraham’s like, “Ugh! O.K. If you say so, I’ll sleep with your beautiful, young Egyptian slave-girl! If I have too!” No, we don’t know how Abraham responded to Sarah’s suggestion, except he agreed to do it. And, well… that plan worked out about as well as you can imagine. Hagar, unlike Sarah, got pregnant right away. And Sarah, understandably, got jealous. Finally, when Sarah had her so, Isaac—well, they didn’t need Hagar and Ishmael anymore, so they sent them packing. Like old, discarded toys, Hagar and Ishmael are rejected… discarded… abandoned. Wandering in the wilderness, homeless, without hope, dying of thirst. Even worse than being rejected by Abraham and Sarah, Hagar must have also felt rejected by God! Abraham and Sarah were God’s people after all, and she was kicked out of the family. It’s heartbreaking! But that wasn’t the end of the story for her and Ishmael. Scripture says that just when Hagar had given up hope, God opened her eyes, and showed her a well in the desert—with water. She and her son were saved. And scripture says that God blessed them and made Ishmael into a great nation. Is there anyone around here who could use some hope? God will never abandon or reject those of us who have placed our faith in his Son Jesus. Jesus offers us living water, and he says that whoever drinks of this living water will never be thirsty again! We drink of the water that Christ offers and receive eternal life! 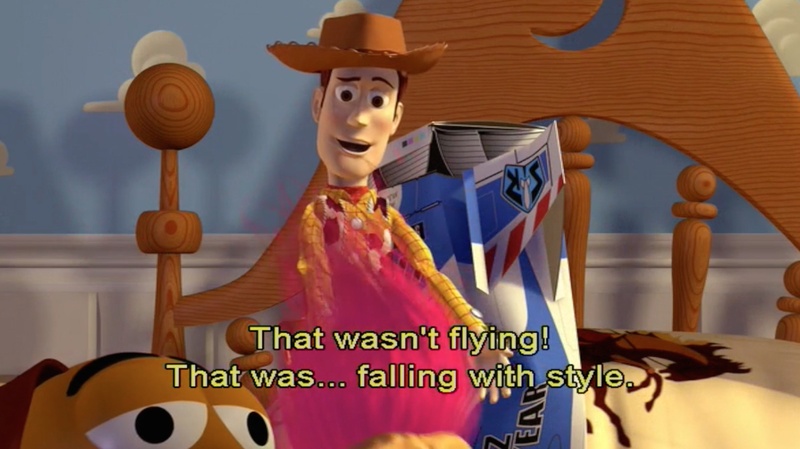 In this next scene, we see that Buzz has a problem. He thinks he’s really a Space Ranger, and not just a toy, until he finally realizes the painful truth. So the first sin has to do with trying to be something that we’re not. We try to run our lives and run our world like we’re God, and all of human history tells the tragic tale of where that leads. 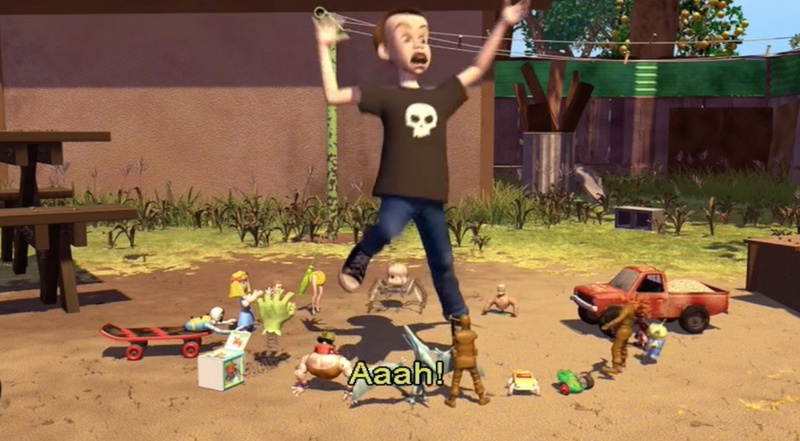 As you can see in this clip, Buzz tries to be something he’s not. He has an incredibly difficult time accepting the fact that he’s only a toy. He wants to be a Space Ranger. As hard as he tries, however, he can’t really fly. He can’t really shoot lasers. He doesn’t fight evil. He’s not stationed in the Gamma Quadrant of Section 4, and he’s not a member of the elite Universe Protection Unit of the Space Ranger Corps. At the end of the clip he comes to grips with the fact that he’s isn’t a Space Ranger. But that sends him into a tailspin of depression. Because if he can’t be a Space Ranger, he wonders, what good is he? Are we so different? Aren’t we often tempted to find our value and self-worth in something or someone other than God? I know I am! For me, I’ve always wanted to be perceived by others as a professional success. At my sinful worst, I want other people to recognize me and appreciate me and love me for how good and competent and successful I am at my job. I want awards. I want recognition. I want praise. That was true when I was a student in college, it was true when I was in sales, it was true when I was an engineer, and it’s true even now that I’m a pastor. If I can’t be at the top of my class, or at the top of my field, or at the top of my profession, what good am I? The point is, we often try to fill up this God-shaped hole in our hearts with something other than God and what God offers us, and that’s a prescription for unhappiness. Through a series of misadventures, Buzz and Woody get trapped at their next door neighbors’ house. A bully named Sid lives there. Sid enjoys breaking toys, torturing toys, blowing up toys, mangling toys. 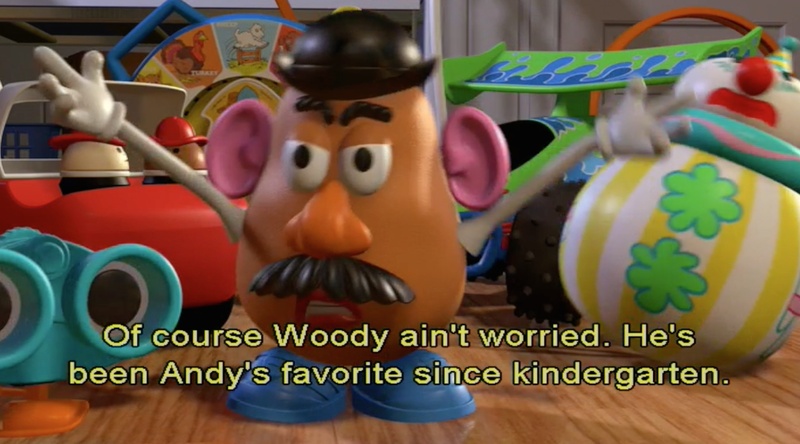 And unless Buzz and Woody escape, he’ll do the same to them. Buzz says: “I’m just a toy, a stupid, little, insignificant toy.” And Woody says, “Being a toy is a lot better than being a space ranger… Look, over in that house is a kid who thinks you’re the greatest, and it’s not because you’re a Space Ranger, pal. It’s because you’re a toy. You are his toy!” And then Buzz looks at the bottom of his boot, where his owner, Andy, wrote his name on it. 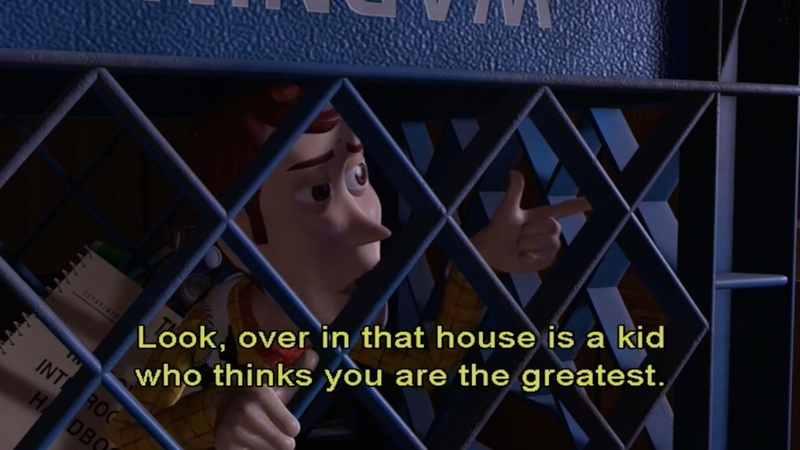 Buzz realizes that his value, his worth, his identity doesn’t come from who he is; it comes from whose he is. His value comes from the one to whom he belongs. And so it is with us… Belonging to God, being owned by God, being a child of God… That’s worth infinitely more than any kind of treasure we can find on earth! We are that treasure buried in the field for which the man sold everything he had to purchase! We are that precious pearl for which the merchant sold everything that he had to acquire! What does the apostle Paul say? “You were bought with a price.” God himself paid everything he had to acquire us—because he bought us with his own precious life—God the Son, the Second Person of the Trinity, gave his life to save us! And like Andy in the movie, God thinks we’re the greatest and wants us to come home and live with him for all eternity! And when we give our lives to Jesus Christ, it’s not exactly like God writes his name on our foot, but he does the next best thing: Paul says that he puts his seal on us when he gives us the Holy Spirit. That means we belong to him! In this final clip, Woody, in cooperation with all of Sid’s damaged, misfit toys, hatches a rescue plan to escape from Sid’s house. It’s good to have a healthy fear of the Lord! Besides, in the Bible, God often uses fear to get people’s attention, to wake us up, to turn their lives around. And that’s a good thing! I’m thinking, for example, of a man named Balaam in the Book of Numbers. Balaam was a pagan priest and prophet who was commissioned by one of Israel’s enemies, King Balak, to call down curses upon Israel. And he’s on his way to do just that when the donkey he’s riding on stops suddenly. The donkey refuses to go any farther—no matter how hard Balaam abuses the animal! Suddenly, like Woody in the movie clip, the donkey starts talking, telling Balaam not to mistreat her. God was speaking through the donkey! Which goes to show that if God can do that, then he can surely speak through a jackass like me! Anyway… Then Balaam sees something that nearly scares him to death: the reason the donkey stopped moving in the first place was because, unlike Balaam, she saw an angel standing in front of them—and the angel was not one of those sweet little baby-like angels; no, he was carrying a sword and would have used it on Balaam had he gone any farther. So like Sid in the movie, Balaam sees this terrifying vision and repents of his sin. There’s a popular worship song by Chris Tomlin, which includes these words: “I know who goes before me/ I know who stands behind/ The God of angel armies/ Is always by my side.” That’s what this scripture is all about! As Elisha’s servant realized, we have a God who sends angel armies to protect us! Just because we can’t see them doesn’t mean they aren’t there. Don’t be afraid. Those who are with you are stronger and more powerful than whatever you’re facing! We often don’t have the vision to see the many ways that God and his angel armies have delivered us from trouble. So instead we might say, “Whew! I got lucky! Dodged a bullet that time! I’m so glad the worst case scenario didn’t come to pass.” But wait a minute: this scripture challenges us to imagine that often that worst case scenario didn’t happen because God and his unseen angel armies were taking care of you, protecting you! Praise God! This entry was posted on	July 28, 2014 at 6:12 pm	and is filed under Uncategorized.